The coral reefs extend across five coral atolls, including the submerged Great Chagos Bank, which is an impressive 13,000 km2. There is much to protect. Funded through the GB Non-Native Species Secretariat by the UK Government, a team of ecologists led by the Centre for Ecology & Hydrology had the opportunity to visit the British Indian Ocean Territory. The overarching aim of our expedition was to work with the small environment team on Diego Garcia, the only permanently inhabited island, to derive a list of invasive non-native species with the potential to arrive, establish and threaten biodiversity and ecosystems, human health or the economy. As we prepared for the visit, in collaboration with the British Indian Ocean Territory Administration, we were all aware that we were immensely privileged to have this opportunity. Not only to see the amazing wildlife and beautiful environments of the archipelago, but also to meet with the people working to conserve this precious place. 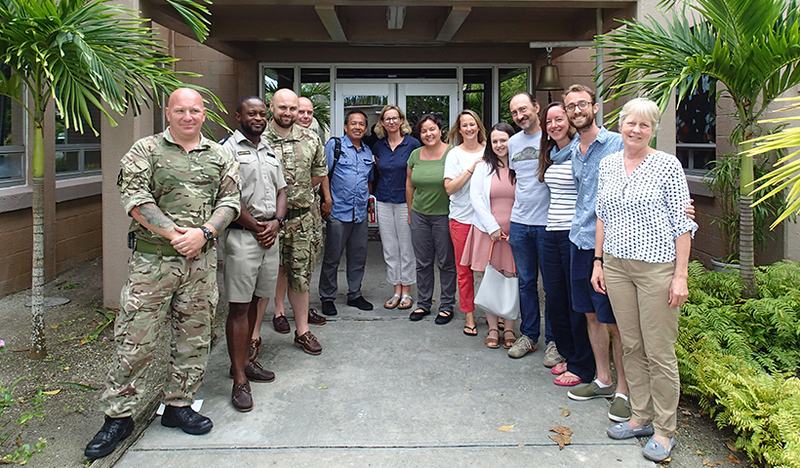 The knowledge and passion of the UK and US environment teams for the remarkably varied habitats on and around Diego Garcia is incredible. Through two workshops, we were able to work collaboratively to agree priority lists of invasive non-native species to inform biosecurity. Many of the top threats identified were snake and ant species. There are no snakes currently established on the British Indian Ocean Territory but there are a number of non-native reptiles and, sadly, many rats. These species, particularly the rats, are already causing problems, but the potential future arrival of the brown tree snake, Boiga irregularis, is a huge concern. This invasive non-native species, infamous for invading the island of Guam, has caused ecological devastation leading to the extinction of many birds and a subsequent cascade of knock-on effects. ...the potential future arrival of the brown tree snake, Boiga irregularis, is a huge concern. We were amazed at the abundance and diversity of ants in all of the terrestrial habitats we visited, but through our horizon scanning work we have identified many more that could arrive. Some would have profound human health impacts and all have the potential to disrupt ecosystem functioning. 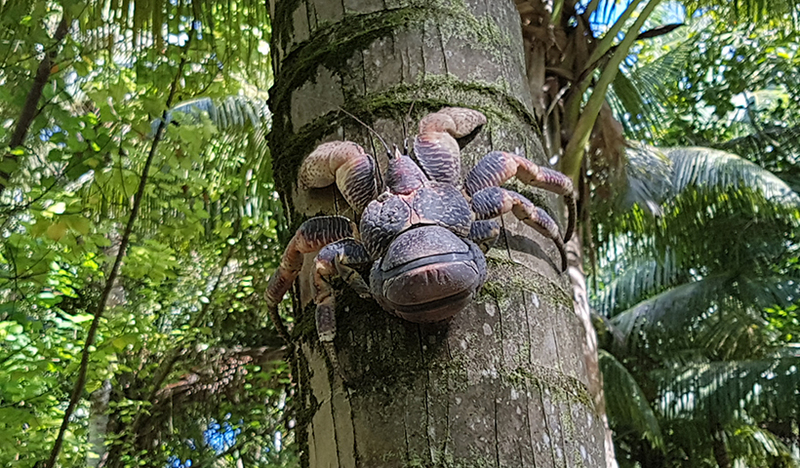 Perhaps most worrying are the potential effects on the coconut crabs. Ants, specifically yellow crazy ants, Anoplolepis gracilipes, have wreaked havoc on Christmas Island through the predation of red crabs, Gecarcoidea natalis, considered a keystone species on that island. Such a situation is not hard to imagine on Diego Garcia and, as a result, yellow crazy ants were categorised as high priority in our horizon scanning exercise. Fortunately, there are simple biosecurity measures that can reduce the risks. We heard from the customs and environment teams about the approaches already in place, and the ways in which pre- and post-border controls have been effective at intercepting a number of species. Everyone has a part to play in biosecurity: both the military and civilians working in the British Indian Ocean Territory can assist in many ways. Raising awareness about invasive non-native species and the problems they cause is important, and there are significant challenges. The community is constantly changing as people come and go. 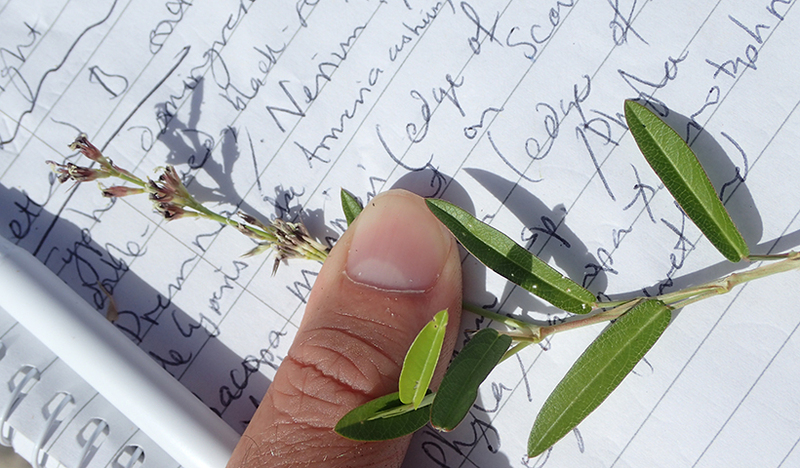 Many of the invasive non-native species are tricky to identify and can be quite cryptic. However, there is a shared interest in protecting the British Indian Ocean Territory from the most damaging invasive non-native species. "...there is a shared interest in protecting the British Indian Ocean Territory from the most damaging invasive non-native species." Memories of this remote atoll, the incredible wildlife and stunning views, but also the wonderful people we met, will remain with us. We have returned home with many thoughts and ideas inspired by our visit to the British Indian Ocean Territory. We are extremely grateful to many people for all they did to make this incredible experience possible but specifically Ariella Combe (Deputy Adminstrator, British Indian Ocean Territory), Harri Morrall (Environment Officer, British Indian Ocean Territory Administration), Nestor Guzman and Linda Corpus (US Public Works Department, Diego Garcia). Thanks also to our collaborators Wolfgang Rabitsch, Elena Tricarico, Tim Adriaens, Liz Cook, Jill Key and Niall Moore. Ariella Combes, Deputy Administrator, British Indian Ocean Territory, adds, "Biosecurity is an inevitable challenge for such a remote and ecologically diverse Territory. Through collaboration with our US partners, the BIOT Administration is proud of our robust biosecurity protocols. However, we are all too aware of the potential devastation that could be caused if further invasive non-native species entered BIOT. As such, we were delighted to receive support from the UK Government to provide further advice on how to strengthen biosecurity. "The new list of invasive species at risk of entering BIOT, and suggestions on how to prevent or react to their arrival, will help the BIOT Administration protect the Territory’s unique environment and incredible biodiversity. We are grateful for the support provided by the Centre for Ecology and Hydrology, and look forward to working together again in the future." 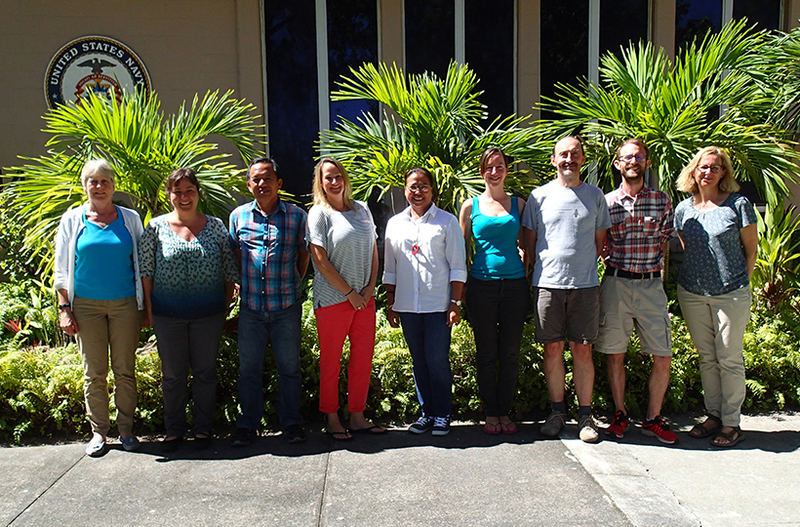 Photo: Participants at the invasive species horizon-scanning workshop on Diego Garcia.